Objective To study body mass index (BMI) changes and metabolic control in children and adolescents during the first year following the diagnosis of type 1 diabetes. Research design and methods 200 children and adolescents (<18 years) diagnosed with type 1 diabetes, started on multiple injection treatment and followed up for 1 year were studied with respect to metabolic control and weight change. Growth curves preceding the onset of diabetes were procured from the school health services. BMI was recalculated into BMI SD scores (BMISDS). Results Glycated hemoglobin (HbA1c) at 1 year was 6.7±1.3% (50±10 mmol/mol). HbA1c was positively correlated with daily insulin dose (R2=0.13; p<0.001), negatively correlated with age (R2=0.03; p<0.05) but not related to gender, BMISDS at 1 year, HbA1c at presentation, or ketoacidosis at presentation. Prior to the onset of diabetes, BMISDS was 0.41±1.20 and decreased to −0.63±1.25 at presentation. BMISDS at 1 year was 0.54±0.97 and not different from the premorbid value (p>0.05). 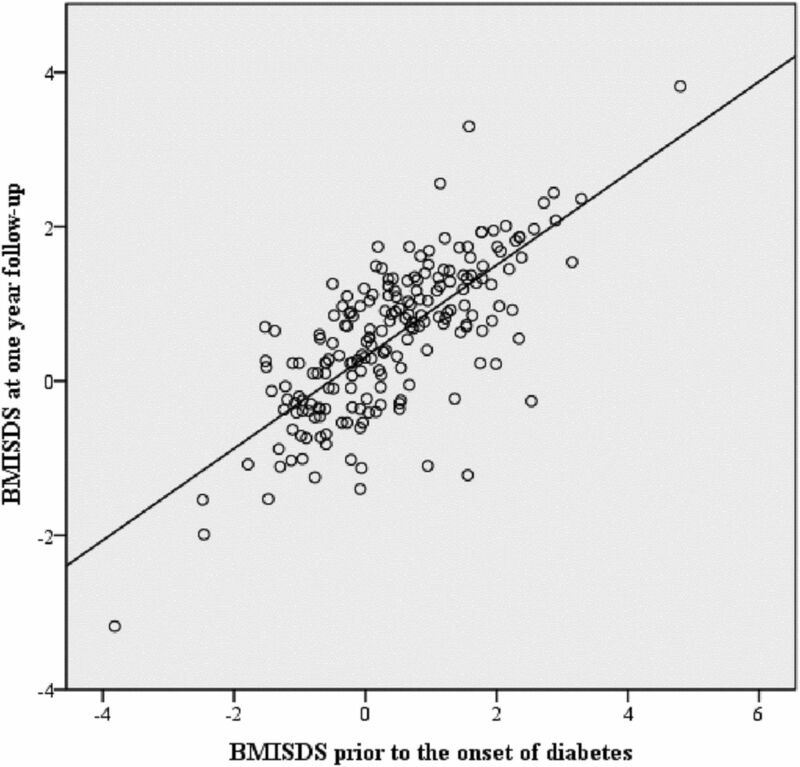 In a multiple regression analysis, BMISDS at 1 year was directly proportional to and highly predicted by BMISDS prior to onset of diabetes (R2=0.57; p<0.001). BMISDS at 1 year was also inversely correlated with age (R2=0.03; p<0.001) but could not be predicted by gender, daily insulin dose, HbA1c at 1 year, HbA1c at presentation, or by ketoacidosis at presentation. Conclusions During the first year of treatment of type 1 diabetes in children and adolescents, it is possible to achieve good metabolic control without excess weight gain. Good metabolic control can be achieved during the first year following diagnosis with type 1 diabetes. There is rapid weight recovery following start of treatment. There is no overshoot in weight compared to premorbid growth trajectories. In studies of the short-term outcome of type 1 diabetes in children and adolescents, good metabolic control is usually achieved 1 year after presentation but weight/body mass index (BMI) is above population average.1 ,4 ,13–16 Premorbid weights and heights are, however, usually not available and it is unclear whether in these investigations findings represent excess weight gain during the first year of treatment or the children were constitutionally larger and heavier. At presentation of type 1 diabetes, there may be a history of overweight and increased linear growth,17 ,18 but there are also several mechanisms by which type 1 diabetes and its treatment could cause excess weight gain.19 ,20 The objective of the present investigation was to analyze BMI changes and metabolic control in children and adolescents with type 1 diabetes during the first year of treatment. The primary aim was to compare BMI outcome with premorbid growth data. A secondary aim was to analyze whether BMI interferes with metabolic control. We hypothesized that the patients would recover their premorbid BMI trajectory early during treatment but that treatment-related factors could confer an additional risk for weight gain. The pediatric diabetes team of Uppsala University Children’s Hospital cares for all patients <18 years of age with diabetes in Uppsala county (population 341 465 of which 69 355 were under the age of 18 on 31 December 2012). This is a retrospective study for the period 2005–2012, when 216 children and adolescents born during 1988–2010 were diagnosed with type 1 diabetes, had treatment initiated, and were followed up for at least 1 year at the Children’s Hospital. Since 2005, the Children's Hospital participates in the nationwide project ‘Better Diabetes Diagnosis’ (BDD), which was started to monitor newly diagnosed children and adolescents with type 1 diabetes for genetic predisposition and clinical phenotypes including BMI.21 Data on family history of diabetes and other autoimmune diseases, weight and height of parents, symptoms and signs of type 1 diabetes at the time of diagnosis, laboratory data at diagnosis and follow-up, and details of treatment were collected and registered in the Swedish Childhood Diabetes Registry (SWEDIABKIDS), a national incidence and quality control register.22 The diagnosis of type 1 diabetes was clinical and decided on before autoantibodies had been analyzed. The Karolinska Institute Research Ethics Board approved the study and informed, written consent was obtained from the parents. The clinical diagnosis of type 1 diabetes did not have to be revised for any of the patients. One child was excluded from the analysis since the family discontinued insulin treatment for a period shortly after diagnosis. Another child with hemolytic anemia due to glucose-6-phosphate dehydrogenase deficiency was excluded from analyses including measures of glycated hemoglobin (HbA1c). From SWEDIABKIDS, basal data for each patient at the time of diagnosis of type 1 diabetes were collected. This included age, gender, comorbid diseases diagnosed before the onset of diabetes, other family members with type 1 diabetes, and immigrant background. Weight, height, blood glucose, HbA1c, blood pH, antibodies to transglutaminase IgA, thyroid peroxidase, and thyreoglobulin at the time of admission were registered. During the first year of treatment, weight, height, HbA1c, insulin dose (units/kg body weight/day), proportion of bolus insulin (% of daily dose), and the use of insulin pump were registered at 3, 6, and 12 months duration of disease. BMI (kg/m2) and BMI SD scores (BMISDS) were generated automatically by the SWEDIABKIDS register.23 Growth charts were procured from the school health services/childcare centers. Two measurements of weight and height antedating by at least 3 months the diagnosis of diabetes were registered. Data including growth charts antedating the diagnosis of type 1 diabetes were available for 200 (93%) patients who were included in the study. Biochemical analyses were performed at the Department of Clinical Chemistry at the Uppsala University Hospital as part of the clinical follow-up of the patients. The laboratory is certified by a Swedish government authority (Swedac). Starting October 2010, HbA1c was analyzed according to the International Federation of Clinical Chemistry (IFCC) standard and expressed as mmol/mol. Prior to that date, analysis was according to the Mono S standard expressed in percent. In SWEDIABKIDS, analyses performed with the Mono S standard were recalculated using the expression HbA1c (IFCC; mmol/mol)=10.45×HbA1c (Mono S; %)—10.62. Presently, HbA1c is expressed in National Glycohemoglobin Standardization Program (NGSP) and IFCC standards (http://www.ngsp.org/convert1.asp). Treatment of type 1 diabetes was according to firmly established routines at the Uppsala University Children’s Hospital and within the framework of the Swedish national programme for pediatric diabetes.24 All patients were hospitalized at presentation. For patients with severe ketoacidosis, treatment was started at an intensive care unit. The majority of the patients were admitted to a general pediatric ward together with a parent following a brief interview, physical examination, and blood sampling. Treatment was immediately started with intravenous insulin with the aim to normalize blood sugar concentrations. Intravenous insulin was discontinued after 2–2.5 days and the patients were started on a multiple injection therapy (MIT) regime with insulin aspart (NovoRapid) added to every meal and insulin detemir (Levemir) once daily at dinner time for basal insulin. A personalized meal schedule with three daily major meals and two-three snacks was introduced. Meals were initially of a set size and with a fixed insulin dose. Families were subsequently taught to adjust doses to different meal sizes. When treating hypoglycemic episodes, measurement of blood glucose and taking dextrose is emphasized to avoid excess caloric intake. From the very onset of MIT, the aim was (near) normal blood sugar concentrations (3.5–7.5 mmol/L) and a target HbA1c<6.9% (52 mmol/mol). Families were taught that physical activity is part of treatment and children were encouraged to continue the physical activities they participated in prior to the diagnosis of diabetes. Both parents were encouraged to take part in scheduled meetings with members of the diabetes team which consists of physicians, nurses, dieticians, and a clinical psychologist, all with training and experience in pediatric diabetes care. One aim of the training during the initial admission was to confer sufficient knowledge and practical ability to enable the families to return to their new everyday life. Another aim was to support the family and help them to meet the crisis of the abrupt and unexpected change in the family. In this context, it is notable that within the Swedish social security system parents can have reimbursed parental leave when caring for a sick child. Beginning at the end of the first week of admission and during the second week, the families were gradually transferred to home, school, and everyday life. Following discharge from hospital after 7–15 days, a diabetes nurse was the primary contact of the family. The family attended ∼10 outpatient visits to their diabetes nurse during the first year of treatment. Other members of the diabetes team participated when required. During this first year of treatment, there was continuous diabetes education and adaptation of the treatment regime to the patients' and families' needs. Blood glucose control was emphasised and vigilance over growth and weight development was maintained. Great emphasis was put on helping the family adapt to their new family life. Statistical analyses were performed with SPSS V.20.0.0. Data are given as means±SD. A stepwise linear regression analysis was used for prediction of outcomes. The 200 participants included in the study were at presentation of type 1 diabetes 9.3±4.4 years old, 58% were male, 15% had at least one parent not born in Sweden, and 11.5% had type 1 diabetes in the primary family (table 1). Eight had celiac disease and four had hypothyreosis diagnosed prior to the onset of type 1 diabetes. At diagnosis, HbA1c was 10.8±2.6 (95±23 mmol/mol) and 22.8% had diabetic ketoacidosis (defined as pH<7.3; table 1). Three months after diagnosis, HbA1c had decreased to 6.2%±1.1 (44±8 mmol/mol; figure 1A). HbA1c increased to 6.7±1.3% (50±10 mmol/mol; p<0.001 by one-sided analysis of variance) up to the 1 year follow-up. Treatment at 1 year was usually by MIT; only nine children used an insulin pump. Three months after diagnosis, the mean daily insulin dose was 0.69±0.20 units/kg/day. At 6 months, it was 0.72±0.2 units/kg/day, and at 1 year follow-up it had increased to 0.81±0.24 units/kg/day (p<0.001). At 1 year, 53±11% of the insulin dose was taken as a meal bolus; this proportion had not changed over the first year (table 2). A further 12 patients had been diagnosed with celiac disease and 3 with hypothyreosis during the first year of treatment. Patients with these comorbidities did not differ in the BMISDS or HbA1c at 1 year. There were no episodes of diabetic ketoacidosis and no episodes of severe hypoglycemia with unconsciousness or seizures. 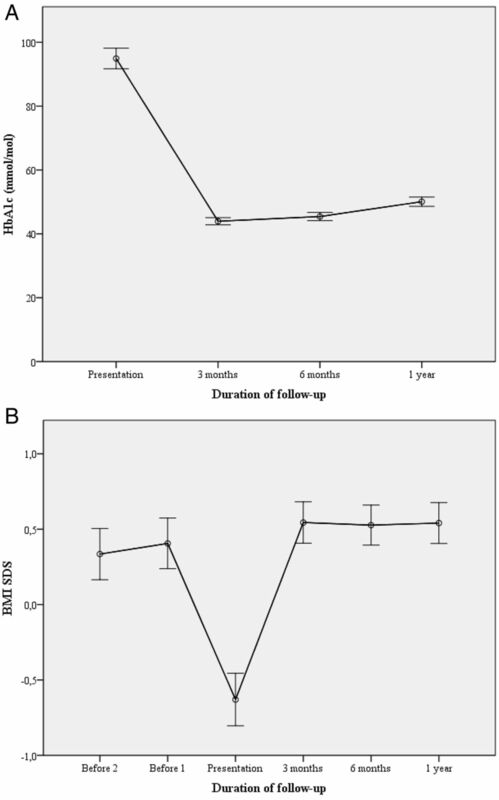 HbA1c (A) and BMISDS (B) during the first year of treatment of type 1 diabetes in 200 children and adolescents. Values are means±95% CIs. BMISDS before the onset of type 1 diabetes is not significantly different from BMISDS during the first year of treatment (p>0.05 by one-sided ANOVA). HbA1c increases during the first year of treatment (p<0.001). ANOVA, analysis of variance; BMISDS, body mass index SD score; HbA1c, glycated hemoglobin. Analysis of the growth charts from the school health services provided two measurements of BMISDS 1.5±1.5 and 3.1±1.9 years before the presentation of type 1 diabetes. The BMISDS was then 0.33±1.21 and 0.41±1.20, respectively (figure 1B). At presentation, BMISDS had decreased to −0.63±1.25 (p<0.001). Following start of treatment, lost weight was recovered and already at 3 months BMISDS was 0.54±0.97, close to the premorbid level. BMISDS remained at this level up to the 1 year follow-up. This was not significantly different from the premorbid values (p>0.05). In a bivariate regression, BMISDS at 1 year was directly proportional to and highly predicted by BMISDS measured at the point closest prior to onset of type 1 diabetes (R2=0.54; p<0.001; figure 2). When BMISDS at 1 year was entered as the dependent variable in a stepwise linear regression analysis, it was positively predicted by BMISDS prior to onset (R2=0.57; p<0.001) and inversely by age (R2=0.03; p<0.001) but not by gender, insulin dose, percent bolus insulin, HbA1c at 1 year, or by HbA1c and pH at presentation. Analysis of the residuals did not indicate a curvilinear relationship between BMISDS prior to onset of type 1 diabetes and at 1 year follow-up (figure 2). Correlation between BMI SD score prior to the onset of diabetes and at 1 year follow-up in 200 children and adolescents. The correlation is highly significant (R2=0.54; p<0.001). BMISDS, body mass index SD score. In a similar analysis, HbA1c at 1 year was positively predicted by the daily insulin dose at 1 year (R2=0.13; p<0.001), inversely by age (R2=0.12; p<0.001), and inversely by pH at presentation (R2=0.02; p<0.05) but not by gender, BMISDS at 1 year, or by BMISDS and HbA1c at presentation. A strength of this study is the analysis of a large number of patients, treated at a single unit with a uniform treatment programme which has changed little over time and has an ambitious treatment target.39 There is a limitation in that some possible predictors of metabolic control and weight changes such as physical activity, Tanner staging of puberty, and measurements of C peptide were not available. These limitations, however, do not preclude the major conclusion of the absence of excess weight gain. In conclusion, with the aid of growth charts from the school health services providing premorbid growth data, it was possible to demonstrate excellent metabolic control without excess weight gain 1 year after presentation of type 1 diabetes. The absence of excess weight gain may help to avoid early deterioration of cardiovascular risk factors. In the light of other longitudinal studies that have shown a successive increase of HbA1c with time concomitant with an excessive weight gain it would be important to extent the present study with a longer term follow-up.
. Barn-och ungdomsdiabetes. 2nd ed. Lund, Sweden: Studentlitteratur AB, 2008. Contributors AG and IS designed the study together. AG collected the data and created the database. The authors analyzed the data and drafted the manuscript together. Funding This work was supported by the Swedish Child Diabetes Foundation (Barndiabetesfonden), Stiftelsen Sven Jerrings Foundation, Stiftelsen Samariten, Gillbergska stiftelsen, and Uppsala University. Ethics approval The Karolinska Institute Research Ethics Board.